Welcome Kit and yes, we really are here at Sally Lunns! The first thing I wanted to say is that I’m sure there are many people who will read this blog who already know all about you. For those who don’t, however, could you tell us a little about yourself? Yes, we’re finally here. I didn’t realise how small Sally Lunn’s is. It is rather quaint, isn’t it? Oh, a hot chocolate for me, please. So, what to say about myself… I live about ten miles north of Bristol, overlooking the two Severn bridges (well, I would if houses weren’t in the way!). I’m married, have one daughter, two grandchildren, and have a passion for music, flowers and plants, and take great pleasure in the wildlife in my garden, especially the birds. Your debut novel Every Step of the Way has been very successful. What inspired you to write it and was it a deliberate plan to embrace saga writing as a preferred genre? I never set out to be a saga writer, it just happened by circumstance. Prior to Every Step, I had written a paranormal mystery called Whitestones (to be published later this year), and two contemporary novels. Every Step of the Way began as a sequel to the paranormal. I was looking for a reason to give my novel family for moving from London to the West Country, when I came across an article in a national newspaper about the 1952 Killer Smog of London. The more I read, the more fascinated I became with the incident, particularly as one of the areas worst affected was where I grew up. A lot of facts surrounding that dreadful event weren’t known to later generations, and I knew I simply had to incorporate them into my story. To me, the novel is more historic semi-fiction, but there doesn’t seem to be a shelf for that in the bookstores. Although I’m halfway through writing a second saga, it isn’t my preferred genre; I much prefer writing paranormals and timeslips. You can have much more fun and freedom with these. There is a history behind the book; it was shortlisted for an award, I believe. How did this happen? The Harry Bowling prize was initially for an unpublished novel in any genre as long as it was set in London. As Every Step qualified, I decided to have another go. The entry had to include a synopsis. Having entered the competition two years previous with a contemporary, and having got nowhere, I thought perhaps I would stand a better chance if I changed Every Step into a saga, as that’s what Harry Bowling wrote. So I reworked the synopsis. Surprise upon surprise, I received a phone call several months later advising me I had been shortlisted. I didn’t win, but as a result, I was taken on by a well respected agent. You are a lady of many talents, writer, editor, artist to name three. Which of these came first and how did this happen? A lady of talent and master of none! Or so it’s been said. The writing came first, from having a love of English as school, I went on to become a reporter, then editor for the school magazine and onwards from there. My working life has always involved working with books, including running my own business keying and typesetting all manner of reference books and journals. I’d been writing poetry for several years before turning my hand to a full-length novel, then another, and another, and so it continues. And did this inspire you to move into the other areas you have now embraced? Well, yes, I suppose it has in a way. I was on a writers’ holiday some five years ago when I sat in on an art class. Art has always been inside me; I studied it at grammar school and had dabbled feebly with watercolours to no success. The tutor suggested I try acrylics, and I haven’t looked back since. I certainly never expected my any of my paintings to sell, that’s for sure. Which do you enjoy most? I love both equally. One inspires the other. The painting can be exceedingly relaxing to do but, like writing, it can be exceedingly frustrating when things aren’t going as planned. My business and working career had given me a lot of insight into publishing, although it has changed greatly over the years with the invention of computers etc. My agent had been unable to secure a publisher for me and, having been made redundant a couple of years ago (gosh, is it really that long?) I decided I would put my knowledge and experience to use and do something with my time, and help other writers too in the process. And now for some general questions. Where is your favourite holiday destination and why? Greece, Greece, Greece, every time, although I did fall in love with Barbados and Austria. No, it is definitely Greece, the Greek islands. I’ve visited several, my favourite to date is Kefalonia. I love the climate, the warm sea, the food, the wonderful people, the nature of the land, Greek history and its many myths and legends. The only thing I don’t like is the written language, I can’t read a word of it! And lastly, a regular question I’ve started to ask. If you could invite four famous people to dinner who would you choose and for what reason? James Martin – he’s gorgeous, I love his car collection and he’s a brilliant chef. I would invite him to cook dinner for us all. After we’ve eaten (I wouldn’t expect him to do the washing up), I would persuade him to take me for a drive in one of his fabulous sports cars. Andrea Bocelli – he’s gorgeous too, and his singing is simply heavenly. He’s the only singer whose voice can make the hairs on the back of my neck stand up. I would invite him to serenade us after our lovely meal cooked by James. For sparkling and stimulating conversation I would invite Brian Cox, the astronomer. Apart from being gorgeous too (have you noticed the pattern here? ), I am deeply intrigued and fascinated by the stars and planets, and am a secret Star Trekkie. I can spend hours outside at night studying the stars. It would be wonderful to have Brian there to teach me all about them. My final guest would be Leonardo di Vinci. Not so gorgeous, but he was a very intelligent and knowledge man far in advance of his time. I would love to give him the opportunity to discuss his theories with people who are now enlightened in the ways of the world and the universe. Afterwards, he would be able to capture the dinner party in a painting for prosperity, as only a true artist can. A fascinating collection of guests with a wide mix of talent to sit around your dinner table! Am sure you would have an amazing evening! Thank you for coming along and guesting on Tea and Talk, it’s been great to spend some time with you. Next week, the big double bill, I will have Michelle Bentham with me on Saturday the 16th and Linn B Halton on Sunday 17th. Watch this space! If you would like to come along and chat to me at Tea and Talk at Sally Lunns simply drop me an e-mail on taurusgirl185@gmail.com and I’ll book us a table. Wonderful interview, ladies. 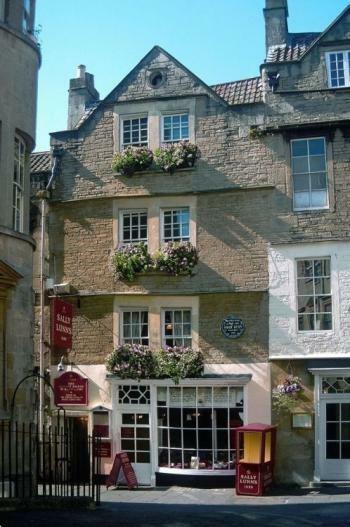 One of these days, we’ll have to meet up at Sally Lunn’s together – and not just here in the virtual world. Every Step of the Way is on my TBR list, Kit. I love the fact that you took an actual historical event and spun a work of fiction around it. If I can borrow my cousin’s phrase when referring to my website – “it’s a fine blend of fact and fiction”. Fabulous interview. Kit, I am *so* coming to your dinner! Thank to Jo for hosting… Cheers! You can’t get anything better then a cup of tea and a chat, this was a lovely insite to Kit Domino and her writing, also i must agree with her all the way ‘Greece is the word’. A country you can never get bored with, great weather, beaches and food. Lovely to see you here Kit, with the fab Joanna! Wish we could all join you for tea!